Change can be inevitable, and is often the only thing constant within organizations. 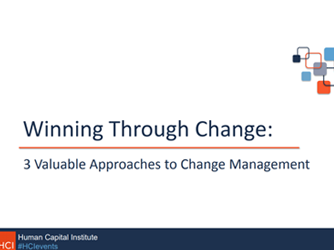 However, failed change management initiatives leave your organization at risk for lower employee engagement and higher turnover. In fact, Quantum Workplace’s 2017 Employee Engagement Trends Report revealed that when it comes to organizational change, nearly one-third of employees are either uncertain or don’t understand why the change occurred. When your organization faces imminent changes, how will you leverage the voice of uncertainty in your organization and lead the organization through change instead of letting the change manage you? In this panel webinar, you’ll hear how two companies, Safelite AutoGlass and GuideWell, tackled communication issues and employee morale challenges through three different times of change.